When presented with a complex surgery or abnormal anatomy, surgeons have always sought out means to plan the safest possible surgery. From the early days of x-rays to the modern forefront of CT and MRI scanning technology, the desire to provide their patients with the safest treatment possible has driven the advance of surgical planning techniques. 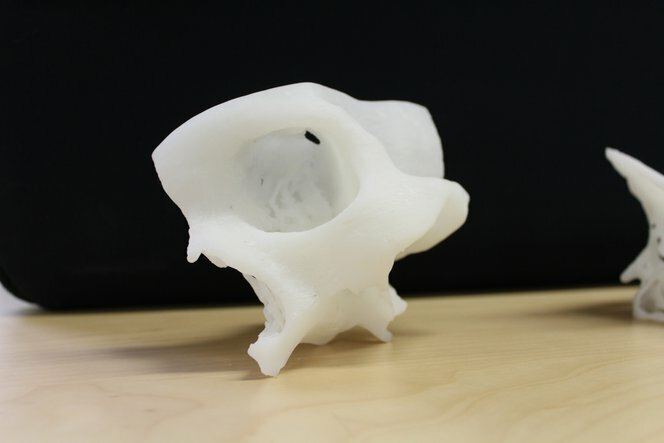 With 3D printing technologies becoming ever more accurate and accessible, medical professionals are increasingly turning to tools like Formlabs 3D printers to print surgical reference models. Back in October, we met Tom Luhrs of Autonomic Technologies at Inside 3D Printing in Santa Clara, CA. We caught up with him to find out how ATI has been incorporating 3D printing technology into their surgical consulting practice. How are you using your Formlabs 3D printer and how is it useful for your practice? We print models of patient skulls for our surgeons to use as reference for planning surgeries. We take CT scans a couple weeks prior to surgery. With the CT image data we are able to create DRR’s (digitally reconstructed radiographs) which allow surgeons to visualize the specific patient anatomy on their computer screen. We then use our Formlabs machine to 3D print these skulls giving the surgeons a tangible model they can study prior to entering the operating room. The 3D models make it much easier to assess the anatomy and accurately plan the surgery. Prior to using the 3D printed models we were only able to provide digital reconstructions and generic plastic skull models. Doctors are now able to use the actual surgical tools and visualize the procedure for each specific patient anatomy which gives the patients, the doctors and Autonomic Technologies, Inc as the manufacturer more confidence throughout. Download our case study to learn how Dr. Michael Eames used a 3D printed model to plan a minimally invasive, low-risk solution for his patient, rather than the alternative of a complex, four-hour osteotomy, saving an estimated $5,500 in the operating room. Some cranial models printed on a Formlabs 3D printer. How long does it take you do to each print? How do you generate the model? The model is generated from pre-operative CT scan data. Each print takes about one hour to go from raw CT images to 3D reconstruction to ready-to-print PreForm file. Generally the skulls take about 6 hours to print on 0.1mm slice thickness and about 30 min to do finishing. How do you see 3D printing changing the medical industry in the future? 3D printing has helped us visualize our designs from the development stage all the way through to the end user in the operating room. The development of biomaterials and biocompatible 3D printing processes together with software capability and accessibility will no doubt lead to more widespread use of the technology. Rather than generic representations, patients and doctors will be able to discuss upcoming procedures with 3D models of their actual anatomy in front of them. Ready to start 3D printing patient-specific models? Download our white paper for a step-by-step walkthrough of the workflow for creating high-accuracy tactile reference models for preoperative planning, enhanced patient consent, intraoperative visualization, and sizing or pre-fitting medical equipment.